One of the great challenges in biotechnology is interfacing synthetic materials with biological ones. Our bodies are designed with an extremely complex network of tissue, vascular, and neural structures to protect us and alarm us if there is something potentially dangerous to our system. If we sit for too long, for example, we feel discomfort and shift positions instinctively. If something is pressing against our leg and threatens to disrupt normal blood circulation, we perceive this threat with pain and pressure and respond accordingly. Amputees and prosthetists have long been facing the issue of how to interface the residual limb with a prosthetic socket. Fitting for a prosthesis introduces a synthetic limb component to a biological one, and an improperly fitted socket can cause pain, pressure sores, and expose a residual limb to infection and tissue damage. And while there has been much improvement from the crude iron prosthetics that amputees once had to endure, there is still much room to improve to make the interface closer to a natural one. One group at MIT has sought to address this disparity by developing a variable impedance prosthetic (VIPr) socket. Using MRI imaging and surface scanning techniques, researchers were able to find the tissue depth and where the socket was most likely to place pressure on the irregular bony areas of the residual limb. A socket was then 3D printed using this data to apply the least amount of pressure when fitted to the amputee. After testing this socket on a below knee amputee, it was found that there was a 7-21% decrease in pressure on various bony areas of the leg compared to a regular socket during walking. While there is still no perfect socket or prosthetic interface for amputees, this is a step in the right direction to protect valuable and vulnerable human tissue. One of the most exciting aspects of current robotics is the amenability and exchange of ideas that can occur with a single product. Both the remarkable ideas and communities that are created are very exciting. I discussed this previously, specifically for open source 3D printing in prosthetics for the 3-D Heals community. But, what if an intelligent arm could be programmed to carry out a wide array of tasks? KATIA from Carbon Robotics is designed for just this, to be to a functional, affordable robot with an open platform to allow versatility. The company has 3D printing and a camera as functions in mind, but is opening up its creator space to the community to give the intelligent arm more functions. KATIA is, according to the site, ‘Kickass, Trainable, and Intelligent.’ The trainability is a very unique feature, as it appears that once the arm is guided through a motion, it can recall the same motion with ease. Designed with motion sensors and attachments in mind, the possibilities of KATIA are great, with possibly huge implications for those needing extra assistance in daily tasks. Go to the site for updates with this project, and contribute ideas if you are a developer that would like to take part of its growth. The abilities of an athlete are often something rather superhuman; more than what an ordinary person can acheive. Thus it’s a very interesting concept by Chris Mann to turn the elements of the endoskeleton into an exoskeleton in a project named Human Quarter-Mile, mimicking the energy and propulsion function of our muscles and tendons in a 3D printed hardware format. As the worlds of 3D printing for healthcare and fitness technology move forward, there will be more and more crossover between between the two. This may be the example of such the case. As it is now, this project is an innovative, long researched, and well executed design to enhance what is already present the body. To mimic the muscles, tendons, and nervous input from the body, 3D printed reinforcements are individualized where the place of these structures are beneath our skin. A shoe mimics the intricate network of musculotendonous structures that make up your individualized limb; after measurements each product is printed for the individual. A testament to the design is that in test it did not fall apart during running, when approximately 2.5 times your body weight is forced into each limb. The ‘shoe’ is described as an “energy storage and release/delivery system,” mimicking how the process of energy is released through musculotendonous structures in our own systems. This amazing product is still in the development phase, accepting donations to further the project. While we don’t normally consider them much until they are injured, our hands are extremely complex and multifunctional, allowing us to carry out the numerous tasks of our day. Truly then, the evolving nature of bionic hands is amazing, getting closer and closer to mimicking the real thing. Saarland University is developing a bionic hand with bundles of smart wires that mimic the bundles of muscle fibers that comprise our muscles. In addition, these bionic hands have sensors built into the wires, much like our our own muscles, which have a ‘shape memory’ and can make precise movements similar to our own hands. This is a huge step toward solving the mechanical problem in prosthetics of trying to match the fine motor movements of a regular anatomical hand. Though there is no official site for this product yet, the university outlined some of the amazing features of their project in a press release. The combined ‘shape memory’ and bundling of the smart wires also allows heat to be dissipated faster throughout the muscle-like complex, and as heat is energy this allows faster and more precise movements in the hand. The built in sensors in the smart wires also have a position sense, much like the receptors in our own hands that detect a change in position. This is how we know what position our hand is in without having to look at it. These small, but important features are the reason why this project, when it moves forward from the prototype phase, will provide great benefit for its users. 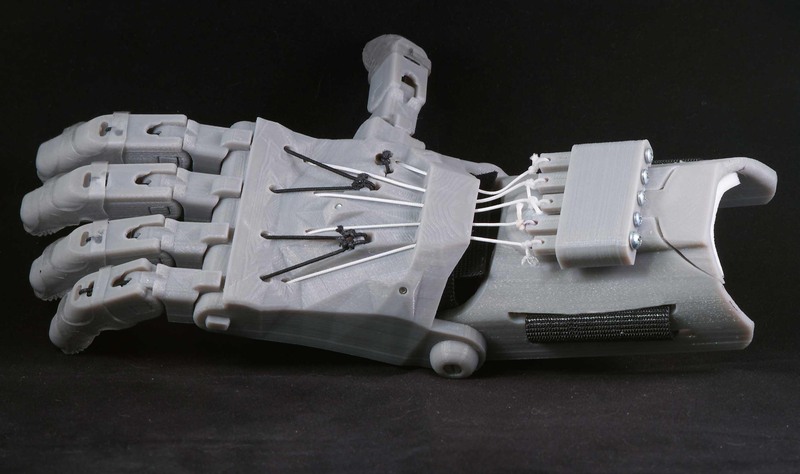 In honor of the upcoming Maker Faire Bay Area, I’d like to revisit the great e-Nable community, which comes together to provide 3D printed prosthetics for hand and finger amputees. The e-Nable community includes many things; a collection of open source hand and finger designs accompanied by an international team of volunteers which include engineers, teachers, 3D printers, designers and of course receivers. Once someone in need of hand reaches out to the community, they can find someone nearby with a 3D printer and assistance for fit and assembly. There is constant growth with the core of providing affordable prosthetics; there are events, forums, and the designs are constantly being discussed and modified on its Google+ community. When e-Nable first started, it was with a handful of people and designs. There are now more than 5000 volunteers, and the open source design categories have now grown to 9 on the website including hand, wrist, and partial hand prosthesis, with numerous variations of each. 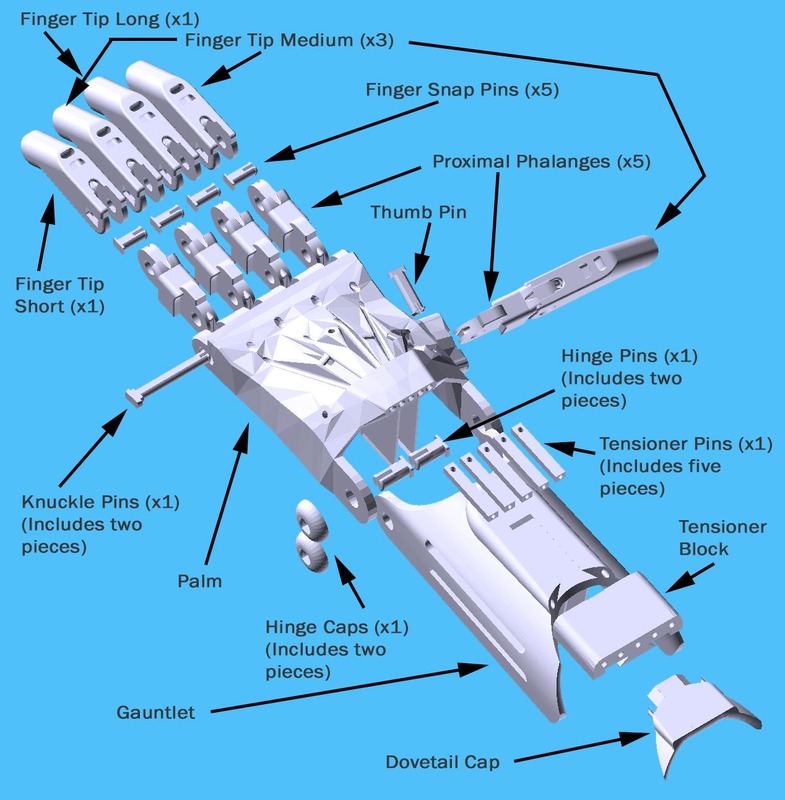 I’d like to spotlight the ‘Raptor Hand,’ a great complete hand prosthetic design which was made in mind for ease of fabrication. This post is to highlight a product which is simple, beautiful, and readily available for the general public. While we often get caught up in the glitz of newer technology, the reality is that with government rules and regulations, it is often a significant amount of time before end users have access to many newer products. If you are an amputee, for example, UNYQ has provided an immediate solution for the minimal shape and aesthetics of current prosthetics. To lose a limb not only has high physical, but also psychological cost. Beyond the physical healing of an amputated limb are also everyday questions and glances as a reminder to the injury. UNYQ has designed numerous customized prosthetic covers to add style and dignity beyond the functionality of a lower extremity prosthesis. Customers simply go to the site, take measurements and photos of their unaffected leg, and provide some information about their current prosthesis. 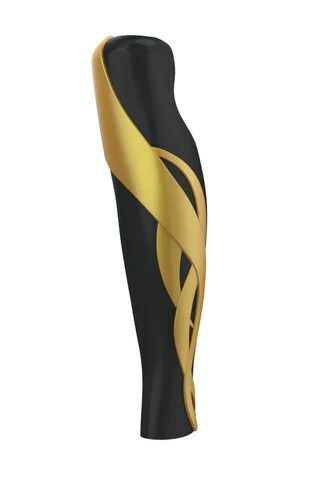 One of the great attributes of UNYQ is that it provides prosthetics covers for both below knee and above knee amputees. Once the measurements are completed and design is chosen, the prosthetics covers are printed using ABS (Acrylonitrile butadiene styrene), a type of plastic material used for 3D printing. The beauty of the designs really is stunning; there are many to choose from, and the themes range from camouflage to runway with the additional option to design your own. For someone dealing with loss of limb followed by essentially a peg prosthetic replacement, these covers recover some of the physical dignity and beauty that may feel lost with the injury. One can wear jeans and fitted clothing and regain some of the symmetry lost with the amputation, or reveal the design when wearing shorts or shorter clothing. The other great attribute of UNYQ is the relatively low cost; it can be partially reimbursable by insurance. Please visit the site for more details and to brows the designs and personal stories on the website. There are options for men, women, and children. 3D printing is truly changing healthcare, allowing us to print everything from hearts to skulls to exoskeletons to hands. This revolution has paved the way for making replacement limbs for amputees financially accessible. In England, a young roboticist has made it his mission to begin a project to provide a low cost, open source 3D design kit for those with missing hands. Through crowdfunding, Joel Gibbard of Open Bionics was able to create a low cost robotic hand kit, including designs for both a robotic myoelectric hand and a prosthetic hand. The robotic hand is titled the Adams Hand, using electric motors to replace muscles and steel cables to replace tendons. Movement of the intact muscles of the forearm and wrist enable synergistic movement of the device, meaning that an action such as bending the wrist would engage the bending of the 3D fingers and hand. With grabbing an item, the fingers stop once there is an object impeding their movement. Thus, the hand is able to master the task of grasping a fragile, uneven object such as an egg. The project is geared both toward amputees and researchers for use in advancing the field of robotics. A DIY kit includes Adams Hand, Servo, Wrist (with generic connector), wire tendon, mounting screws, servo horn, and instruction manual. A price is not yet set. Please see the video below. As technology and the 3D printing boom in healthcare moves ahead, it’s inspiring to see that some are still thinking of people that may not have access to all the great healthcare opportunities that come with more resources.